Early May 2018: Finding out how we’re doing as a school: We did our first standardized testing, over 2- or 3-hour slots on four days. 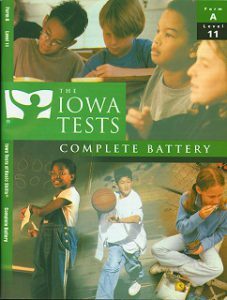 We chose the Iowa Test of Basic Skills, covering language and math for the kindergarteners, and additional subjects for older students, up through science, social studies, and reference materials in grades 3-8. Twenty-eight students took the tests. Thirteen of them scored in the 90th percentile or above on the cumulative or composite scores, with many scoring even in the 99th percentile in individual areas (41 subject-area scores out of 304). Averaged together, our students placed in the 82nd percentile for composite scores. Many scored even in the 99th percentile in individual areas (41 subject-area scores out of 304). We have more details in an allied post. High scores are in part native talent and in part great teaching. We hail our students and our teachers. We use these scores the right way, not to reward or punish students or teachers but to work to improve our teaching methods to the maximum. Separately, three of our students also took the official HSK test of Mandarin Chinese, scoring up to 100%, with an average of 93%, all passing! Kudos to them and to our teacher, Yulin Zhang.